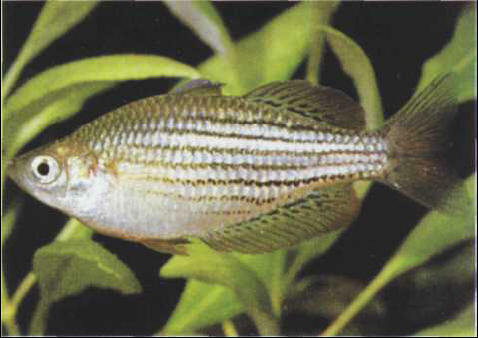 Several closely-related species are marketed under the name of McCulloch's rainbowfish or dwarf Australian rainbowfish. All are robust, demanding a large, uncluttered tank where they can swim in peace - but make sure there is a planted area. The eggs - quite large and hatching in 7-10 days - are fixed to plants by fine filaments: an unusual feature in aquarium fish. The fry remain clinging to a surface (the aquarium wall or a plant) until free-swimming; their initial growth is quite slow. Size: 10-12 cm.